The CA Department of Fish and Wildlife has informed us that the Yolo Bypass Wildlife Area is closed until further notice due to flooding and unsafe roads. The CA Department of Fish and Wildlife has reopened the Yolo Bypass Wildlife Area! The auto-tour loop area is open to the general public with the remainder of the public area opening up once waterfowl hunt season end in mid-February. In December 1992, the Yolo Environmental Resource Center and Yolo Basin Foundation put for a proposal for a YOLO DUCK DAYS festival. The vision was to offer field trips, workshops, lectures, and films “to educate and entertain…birders and others from around the country and world”. The inaugural Duck Days took place just about a year later in February 17-21, 1994. This year will we be celebrating California Duck Days‘ 25th Anniversary. We hope you have enjoyed this wonderful community festival over the years and we hope to see you on Saturday, February 23. We hope you will join us on Friday, November 2 for Bucks for Ducks. CLICK HERE for more information about the event and to buy tickets. Waterfowl hunt season has opened and will continue through early February 2019. General public use of the Yolo Bypass Wildlife Area is now restricted to the upper north-west corner of the Wildlife Area. Areas east and south of this perimeter (red, dotted line on map) are reserved for hunters through mid-February. Except when flooded, the YBWA is open sunrise to sunset everyday of the year except December 25. For information about hunting please contact the CA Department of Fish and Wildlife. The CDFW announced the location of this summer’s Yolo Bypass Wildlife Area shorebird fields. …our new bat T-shirt? It was designed by YBF volunteer, and talented artist, Colette Kitlas. 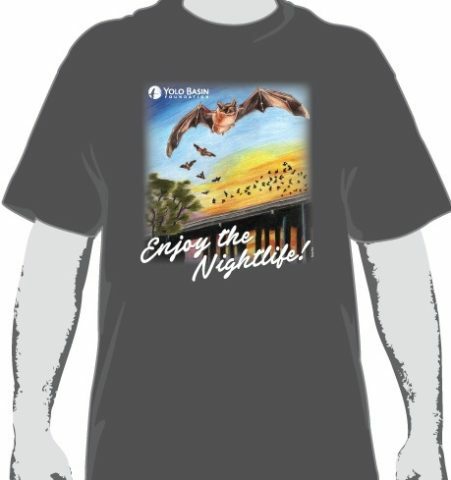 “Enjoy the Nightlife!” is now available and can be purchased at all Bat Talk & Walks and the Yolo Basin Foundation office. T-shirts are $17 ($14 for YBF members). We have revised our membership structure. Yolo Basin Foundation now offers Family and Corporate memberships in addition to Individual memberships. The “Family”, “Corporate”, and “Individual” titles are simply suggestions based on benefits. Those looking to support YBF and stay engaged with our programs are welcome to choose whichever membership best suits their interests. Memberships are the bread-and-butter of our fundraising efforts, providing support for our education programs and conservation goals. We hope you will consider becoming a member. For more information, click here. Thank you to all of our current members. We will see some of you tomorrow on the Members Only wildflower field trip! One of the many perks of having a YBF membership. Good News! The CA Department of Fish and Wildlife will not be requiring a CDFW Lands Pass for entrance into the Yolo Bypass Wildlife Area at this time.